12-Port USB 2.0 powered hi-speed hub enabling you to connect 12 additional USB peripherals to your system. Industrial-grade metal chassis supporting rugged use, is backward compatible with USB 1.0/1.1. Adds 12 High-Speed USB 2.0 Ports to your system. Enables up to 127 devices through a cascading connection. The USBG-12U2ML is a Hi-Speed 12-Port USB 2.0 powered hub that is backward compatible with USB 1.0 and 1.1. It provides an out of the box industry standard that allows connection of up to twelve USB peripherals or devices to your USB ready PC or Mac. 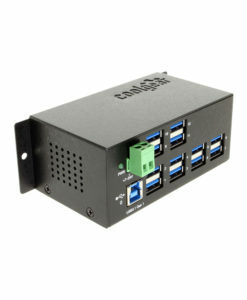 The 12-Port USB 2.0 Powered Hub (USBG-12U2ML) is targeted at PC and Mac Industrial Application users that are expanding the number of USB ports on their system. The rugged metal chassis provides the USB 2.0 hub with a stable and durable construction. The USBG-12U2ML can be wall-mounted or installed onto a DIN rail for convenient access to the ports. 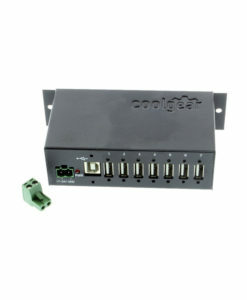 This 12-port hub can be powered with a three pin terminal block connector (7-36V) AC Adapter Required, which is sold separately (pictured below). Click here to purchase the External Power supply for this product. Or, go to the “Optional Accessories” tab above for easy access to the exact item you need! 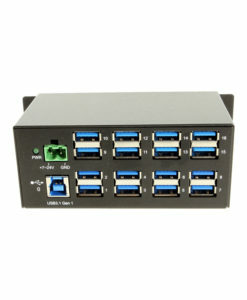 The USBG-12U2ML provides twelve type “A” downstream ports for connecting USB peripherals, devices, or other USB hubs, it is designed to provide quick and easy access for industrial use. A single type “B” upstream port connects the USBG-12U2ML hub to the host computer port or another USB hub. 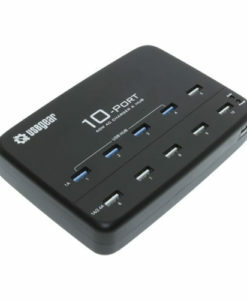 The 12-Port USB 2.0 Hub enables up to 127 devices to be connected by cascading multiple hubs. Configured directly by the operating system, the USBG-12U2ML operates seamlessly with both Microsoft Windows and Apple Macintosh Operating Systems. As a standard USB hub, the USBG-12U2ML buffers USB data from any attached peripheral in compliance with USB specifications to provide an invisible extension of the USB bus. Supporting both low speed (1.5Mbps and 12Mbps) and Hi-Speed (480Mbps) devices, each port creates a bridge between the peripheral and host computer. The hub is multi-tt which was essential for us because we are connecting a sound card to each port. Came with power supply, usb cable and mount plate. Perfect for mounting in a server cabinet. Jet Black aluminum case with integrated Wall Mount flange. Looks well constructed with rubber feet. It is constructed with (12) USB 2.0 type-A Ports and (1) USB 2.0 type-B upstream connection closest to the status LED. The CE FC compliance logo is clearly located on the bottom of the USB 2.0 hub. The hub has a three wire terminal plug for additional power with the 7-24 volt AC power supply included. The packaging for the hub itself surrounds the contents tightly where the hub is resting in a die cut cardboard cutout, the USB A to B cable along with the small package of mounting plates and screws are also contained in the main package. This product lived up to what I expected, it is a USB 2.0 12 port hub which has proved to support my USB 2.0 peripherals used with it including a PC Web Cam, (2) external hard drives, USB Mouse, and (3) USB flash drives, all used in Windows 8.1 operating system. Although I did not have to utilize all 12 USB ports my speeds were at approximately 300Mbits which is normal for high speed USB 2.0 signaling. I did not need to use the external power supply as the external USB hard drives used were Western Digital passport style; this would have been needed if I were using higher power consumption peripherals. The hub looks much bigger than it actually is, it is very compact but well constructed so mounting it either on the wall or table top out of the way is great. Since the USB ports are located on the back wall of the hub, this allowed me to keep my connections much more organized. I didn’t lose information or speed of the devices while transferring any data. TIP: Although the USB ports are grouped nicely for connections, keeping a cable tie handy so the cables don’t end up getting caught or disorganized in some way is helpful. The 3 wire terminal connector is removable and only needs to be present with use of the external power supply. I work with several computer systems and computer peripherals every day, this hub was certainly a plus with the older USB 2.0 equipment we have in organizing our office layout. This is a good versatile hub to use with your USB peripheral management. Special Note: This review has not been solicited by the seller of this item. If you are like me, with zillion USB devices at hand, you do not want to plug it all on your tower, and my experience with USB hub is not great, they are usually built so cheaply they just will not last. After a log of googling, I found that hub. 12 Ports !!! Only draw back, which is a bit silly is you have to purchase the power adapter separately and it has a special connector which you need to find, seriously, a 12 ports hub, it is an absolute must to get it powered. In anycase, once it is powered, it works flawlessly, never once I had an issue. Even with wify headphones that came with a warning that it would not work on a hub. Also great for rackmount system since it comes with the rackmount attachments. As far as I am concerned, there is no other such hub. So I have had this product for a few years now, and been very happy with it. I have a large powersupply connected to it and have over 8 ports used on a regular basis including kbd, mouse, trackball, several disks, printers, etc. and it Just Works. The price is not for the faint of heart, but I can say you get what you pay for in this product. My only grief is it didn’t come with a power supply. Make sure you get a good one, or scavenge an old 5VDC supply, when you purchase it.